Every 2 year old boy wants something special, whether it is his birthday, Christmas or just a treat because he has been a good boy and with these 21 gift ideas, there is surely something he will love here! There are loads of different types of gifts in this review. Some of these toys range from sporty toddler types toys, little guy drill toys and even some kids diy tools. There are loads of toddler LEGO sets, musical instruments, RC car toys, captivating stories, toddler backpacks, building block ones too, ride-on toy gifts and loads more to choose from. So, whatever you’re looking for whether a small gift or something big, you will find it in this review of what are some of the best toys and gifts for little boys aged 2 years and up. 2.1 What to get a 2 year old Boy on his Birthday? Every parent wants to make sure their child has the best toy gift, however, some might be buying a gift for someone else’s child, which means things better be right. You wouldn’t want to give them a present that, God forbid, they choke on for example. This is why we have specifically chosen gift ideas for 2-year-old’s, that are recommended by the manufacturers and have set guidelines with safety in mind for being an age appropriate toy. Other families are concerned about educational toys and want gifts that promote the child’s well-being and development. Most parents agree that most toys have been made to promote learning and enhance the child’s cognitive function, including motor skills, language development, and help hand-eye coordination. However, there are some toys that are unique and offer better quality designs, which is why we have a full range, from playful to educational, there really is something here for every toddler. Sometimes price can be a factor for choosing a present and when there is need to choose based on a set budget, you’ll appreciate that we have a huge range of toy gifts ranging from $10 up to $150+, which is ideal for every occasion both Christmases, birthdays and random acts of kindness. This is a perfect gift for the father that wants his kid to get into sports and especially basketball. The colorful design makes this very attractive and easy to use with a LED light to keep every hoop recorded. The net is also a good height for them to practice and get those 3 pointers as they reach the later stages of being a toddler. The balls, both soccer, and basketball are soft, which makes it easy for the little toddler to grasp with their hands, which is ideal. The balls and net height make for an easy slam dunk into the basketball hoop, as if it was like Michael Jordan back in the early days. There is a purple lever at the side of the backboard and with a pull on it, the score resets itself to zero and the game begins again. This toy is thoughtful in its design and has introduced shapes, numbers and different sounds to begin teaching through interactive play. The sports center early learning game comes with over 50 songs, all unique and sound great for the game night, all dad needs now is a beer. The balls, both soccer and basketball, are good for increasing motor skills and the kicking and throwing aspect is a must-do activity for every toddler looking to prepare for nursery and kindergarten. This has been designed for children as young as 1 years old to 3 years old, and with a safe design, it really is a good choice as a gift. The scoreboard is perfect for keep track of each game played and will count all the way until 10, so as each basket adds up the fun increase also. This is done with each score and ball through the net, there is an animation that amplifies the gameplay. There are also unique sounds and phrases, which is why this is a popular gift for moms when getting their little one something fun that doesn’t get boring quickly. This is a fun gift for the aspiring builder. Your little boy will absolutely love having his own tools. Toys like this will develop your toddler’s imagination to new levels since the fun for them here is that they get to create their own games and activities with their toolset, and pretend they’re a grown up builder. This builds both imagination and confidence. 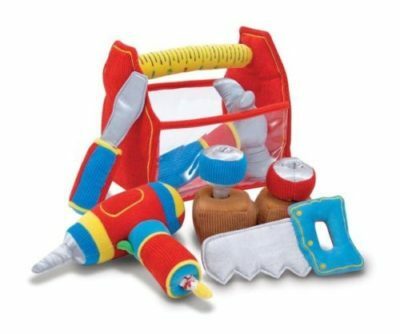 The set contains lots of goodies for your little boy to have fun with, including a hammer, nails and saw which he can use to build his pretend house, a vibrating drill, blocks and a handy screwdriver. The toolbox its self is lovely and soft, with a nice thick, easy to grasp handle that’s also a ruler which he can use to measure things with. The set is constructed of fabric and plastic, so it’s completely safe and the manufacturer’s recommended ages are 2 to 4 years, but I personally think that 4 is a bit too old for a toy like this. 2 is really a great age for imagination based toys like this one. Lego is a game that gives hours of fun and helps encourage creativity in an easy to use and fun way. There are so many different types with all different themes and sets to build, which is why this is a good choice for a children’s gift. This track set is filled with lego pieces and has loads of different fun things to sort out. There is a train and a train track with level crossings included. The wagon and car included in the set mean there are enough lego pieces to go around for everyone to join in the fun. Families and lego go together and some find that it is great for father-son bonding. This might be for children aged from 2 years old to 5 years old, but older grown-ups find this fun too. There are loads of accessories with this play set, which include flowers and creates to make the fun and play last all day. The buildable train has a driver and so does the car and with each sized around over 10 cm’s in height and 28 in length this is big enough to be exciting. The building block idea is a favorite with toddlers and parents agree that Lego is one of the games that kids get countless hours of fun, building, sorting and expanding their world through the imaginary world of lego. Every little kid wants an RC car at some point in their childhood and it comes as no surprise to most parents. This toddler rc car is designed to be easier to use than most other RC cars, which is why this toy gift is a bundle of joy, lots of laughs and super-exciting for any 3-year-old boy! This RC car has music to ramp up the sounds, lights to dazzle the onlookers and with easy to use controls, which is why this is ideal for a first-time user RC car. 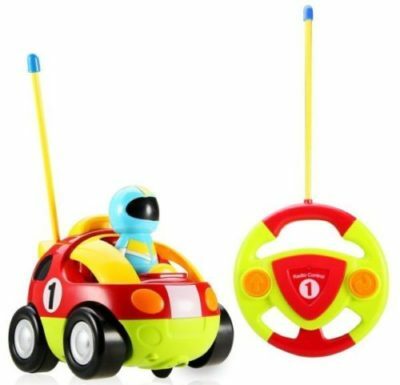 This features 2 channels with a forward and reverses function, which combined with steering left or right makes this almost as good as the big-boys-toys. The honking sound is a fun and will get a few laughs from people, including the little guy. The driver of the car can be removed and placed as an action figure. 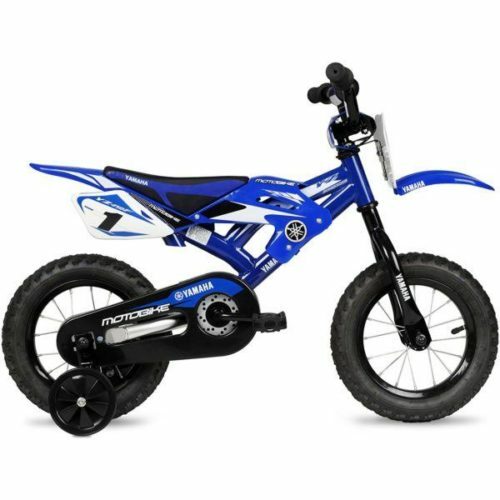 This is designed for children 18 months and older, which is why this is the perfect for any occasion, whether a present for Christmas or birthday and for those buying for another friend’s child this is a safe bet. The brand Kilofly creates great musical instruments that kids love to use and play, which is why this is a quality gift choice. They are designed with children in mind, but also for adults who enjoy playing along and creating rhythm and sound. The toys come in a value pack with a set of a whopping 12 instruments, which is a fantastic start to their musical endeavors. 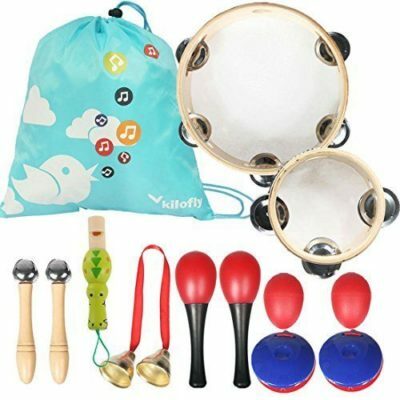 This pack includes; shaking bells made of wood, a whistle, touching bells x 2, castanets x 2, and a musical egg shaker with 2 maracas, which is great value for money, especially with an easy to store and carry bag that comes included. Push and go cars have been around a long time and children always go through a phase of wanting one. With this set, they get not one but three to play with! 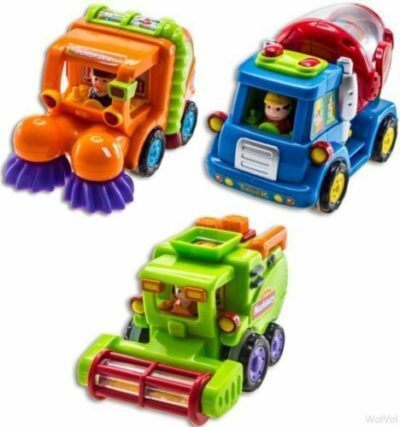 There is a toy green harvester truck, orange street sweeper and a truck for cement mixing. Each one stands out and is easy to use with a push and go motion for toddlers. The set of 3 is friction powered and great for developing motor skills and hand-eye coordination. The way these trucks work is by pushing forward, the more the increased speed, which will in a few motions make the features of the truck come alive and begin to motion forward. Each vehicle has a rotating function, operates like a real truck would and with no batteries needed this is a good choice for a present. I like that each one is well-made and sturdy. Some toys break easily with too much-applied pressure, but these toy trucks are built to last the test of time. This is meant for 18 months old + and with the little boy being 2 years this is ideal. 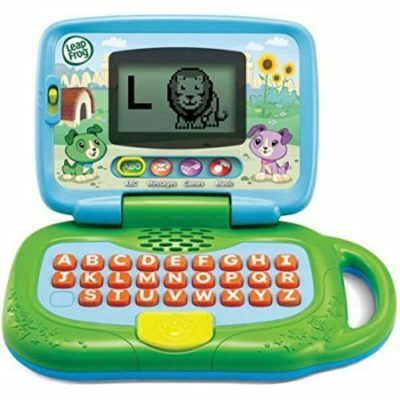 This is an introductory laptop for toddlers and is a computer for helping them learn how to spell their name and develop other skills. This is a frog themed leaptop and is great for helping teach cognitive skills in an age appropriate way with interactive games and activities. The leapfrog features include a large screen for easy visibility, 26 animal animations for fun, 4 unique modes for learning, which include music, ABC’ activities, games and messages for building interaction. I think you’ll little one will enjoy pretending to be all grown-up with pretending to be sending emails, letters and all while singing along to the 16 different melodies that come built into the leapfrog laptop. This is designed for toddler aged 2 years old and above and is ideal for them to carry along with them to visit their grandparents or friends with an easy to carry handle. Some parents find this learning tool is perfect for journeys in the car and other trips where there isn’t too much space. 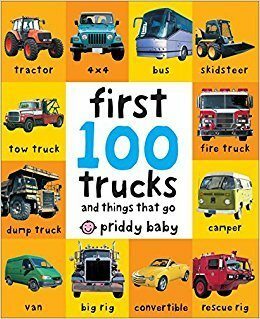 Priddy baby creates great books and this one about all the different vehicles that the world has to offer is a fantastic gift idea for little boys who love their trucks. Most little boys parents find they love trucks, tractors, buses, motorcycles and anything that goes fast. This is why this book is a perfect choice as a gift for those toddlers who love transportation vehicles, big and noisy fire stations and all vehicles that go whizzing by on the highway. These books are aimed at children aged 1 to 3 years old and are a perfect learning tool for them to extend their vocabulary and begin associating specific vehicles with the right name of the vehicle. I like that with these books you can both learn about the different types by visually looking at the pages, but also by sticking the 500 photographs of trucks onto the activity sheets/paper. Learning to match names with visuals is a key component to children’s development and the more words learned at an early stage the better prepared they are for kindergarten, which is why some parents love this book. This Guidecraft is a STEM toy for building and is open-ended play-set, so as far as the imagination goes this toy will extend with the toddlers progress. This building toy is a great gift set and combines fun with learning. The motor skills and shapes make this ideal for learning with. The magnetic structures fit together easily and are an expansion set for them to begin advancing to becoming a little boy engineer. There are 20 pieces in this box set, loads of orange rods, blue, green, yellow and white spheres, which provides enough play-time for them to get countless hours of fun and play. These are high-quality, strong and durable and made to last with rough handling. This does come at a price, but this is fair for the quality of the design. The design has been made a perfect size for not choking on, so ideal for toddlers aged 18 months and older. This is a great gift choice for boys that love building or are showing interest in developing their engineering capabilities because parents know that starting them learning young is the secret to their future. Is it a bird, is it a plane, no it’s your two years old running around saving the world from super villains in any one of these awesome costumes. 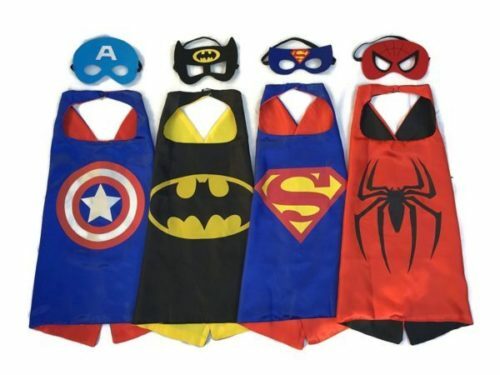 These quality made capes, made from satin, are highly durable and each comes with their own matching mask. The masks are made from felt, this makes them comfortable to wear for long periods of time, meaning that your boy can play for hours at a time. Imagination play is an important part of any child’s development and this gift will help them to develop that. 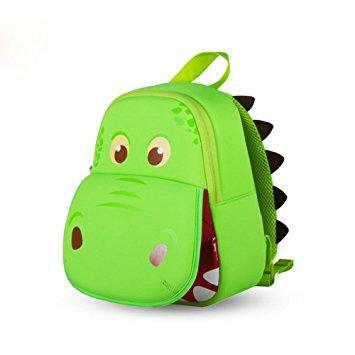 This cute little guy will fit perfectly on your little ones back, allowing them to take all of their belongings with them with ease. Specially designed with children in mind, this brightly colored bag will keep your child amused for hours on end. 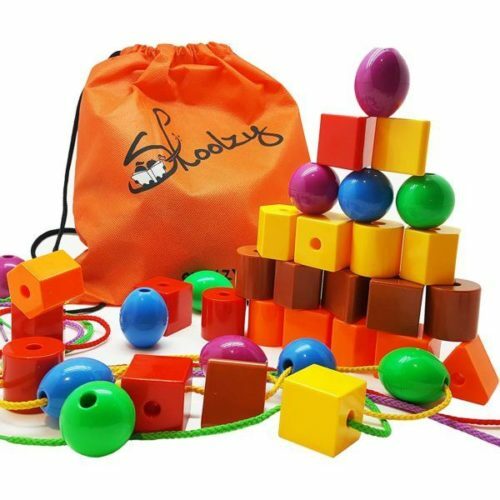 A perfect gift for any two years old, these brightly colored blocks, balls, and string will capture the eye of your child and keep them satisfied. Great for teaching your child about shapes, colors and different textures. The set includes 36 beads, 4 strings, and a carrying bag. The oversized shapes are great for little hands to grasp, meaning that it is great for two-year-olds. This educational toy helps to develop motor skills, dexterity and early skills development. All of this gives them an advantage over their peers when they start preschool. We all remember playing whack-a-mole as children in the arcade, now that fun can be bought into your home and shared with your little boy. Made from high quality, durable resistant wood, the pegs can be hit time and time again without a sign of wear. You can see the little guys face grasp with the concept of cause and effect because every time he hits one of the guys, another peg at the opposite end will pop up. You can even take it to the next level by naming the color as it pops up. A great learning toy. 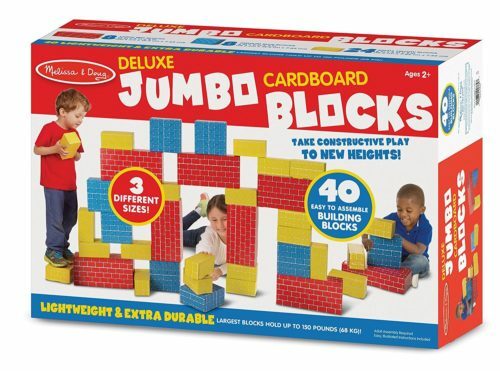 Your two year old will love playing with these premium cardboard blocks from Melissa & Doug. The blocks, made from an extra thick cardboard can hold up to 150 pounds, making them perfect for two-year-olds as they climb over everything. Even though they’re so strong, they weigh so little, your boy won’t have a problem lifting, throwing and building with them. The 40 blocks come in three different sizes and colors to help inspire kids to get creative with what they build. At two years old, walking can still be difficult for a little one. Their curiosity can still be paramount though and they can easily get frustrated when they can’t get from place to place. This little ride and go will cure all those problems. The little bike, coming with custom decals to make it your own, has three wheels. The larger on at the back helps with stability as they scoot around. The seat is fully adjustable so they’ll be having fun as they grow. Designed for use by one-year-olds to three years old. A perfect gift for those that are just starting preschool. Made specifically for 2-5-year-olds, you won’t have to worry about small parts being swallowed and causing trouble. 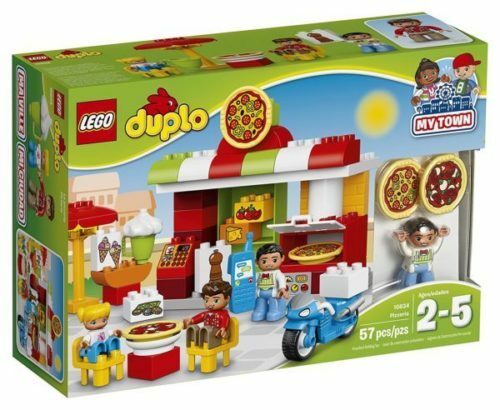 The Pizzeria comes with a buildable pizzeria with opening pizza oven, outdoor seating area with umbrella, ice cream stand, and a delivery bike. 3 figures are also included as well as pizzas, cash register and much, much more. You can watch your little one use and develop their skills whilst they build this awesome little setup. You can watch your little one use and develop their skills whilst they build this awesome little setup. Your boy will marvel at the magic that this walkie talkie brings. Whether they’re in bed, in the yard or just wondering around the house, they’ll be amazed that they can hear you and that you can hear them. These walkie talkies have been tested from a drop height of 1.2 meters, which is taller than most 2-year-olds. You know that they’ll stand up against anything your boy can throw at them. 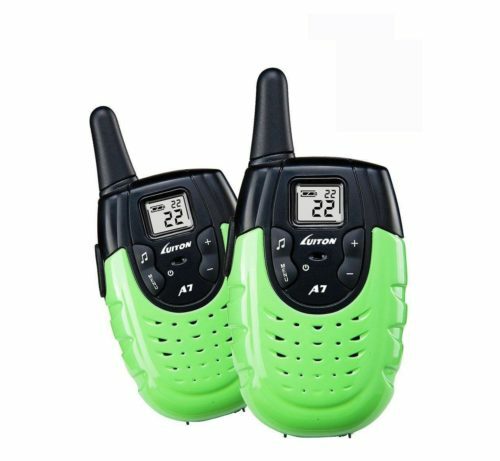 Perhaps the best feature of these walkie talkies is that they come with rechargeable batteries included, no more forking out for expensive disposable batteries. What is a birthday party without some birthday games? 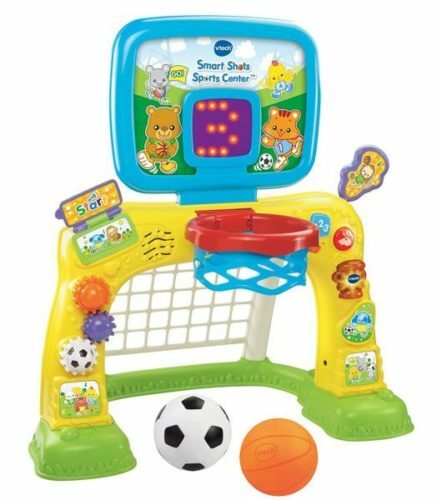 Two-year-olds everywhere will love this basketball set as they score slam dunk after slam dunk. 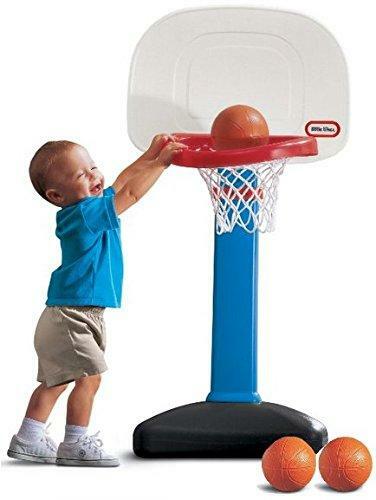 The oversized hoop and adjustable height (2 feet to 4 feet) mean that no matter the skill level of your boy, they’ll be able to keep on getting those points. Three balls are included so it doesn’t matter if you loose one or not. 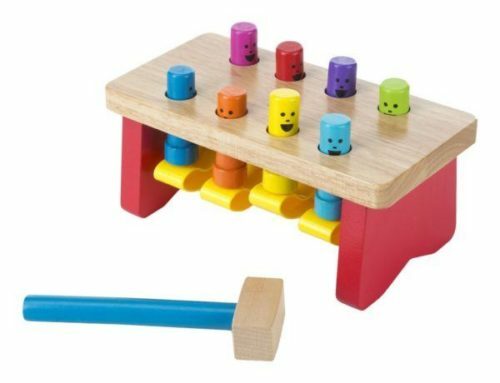 This set can be used as a team game and would develop motor skills, social skills, and your child’s co-ordination. Designed for 1 and a half-year-olds to 5-year-olds, it’s the perfect time to get your 2-year-old one. Frist bikes don’t come much cooler than this, and at two years old, maybe now is the best time to buy a gift like this. This bike’s frame sits at 12 inches high, making it the perfect height for you little boy. The training wheels at the back ensure the safety of your child, as does the added chain guard. No shoelaces or loose clothing will get trapped in there. 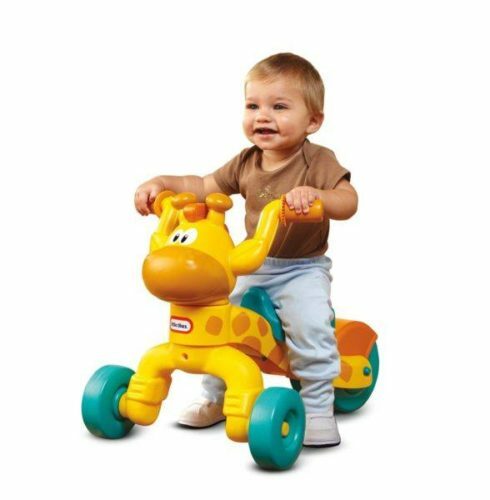 The wheels are rough and nobbly, this will allow your child to ride on any terrain they choose too without an issue. 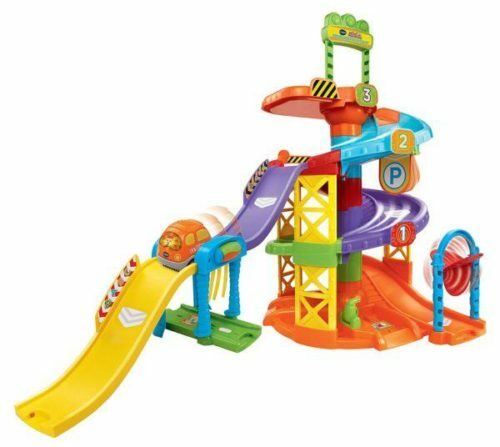 Bright colors and exciting noises will keep any two years old happy, and that’s what VTech have combined when making this smart spinning spiral tower playset. The educational toy, that children build themselves, will help your boy develop his creativity and refine his motor skills. The car feature technology which allows the track to know where it is, making specific noises as it passes certain points of the track. The Van has two AA batteries included so no hassle there. Combine it with other sets to make playtime even more fun! Designed for children aged 1-5. 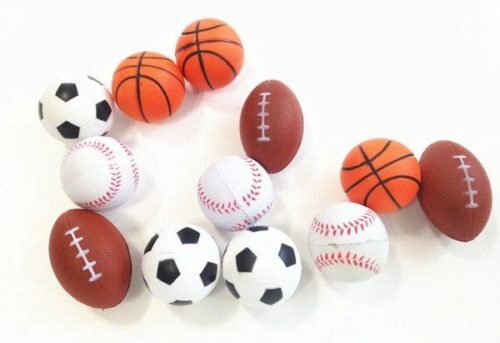 These novelty miniature balls look and feel like the real deal, and two-year-olds everywhere deserve them. With 24 balls coming in each pack, you get a fair mixture of soccer balls, footballs, and basketballs. Small enough for your little boy’s hands to fully grasp them with allowing them to throw and catch, developing their hand eye co-ordination and motor skills at the same time. What to get a 2 year old Boy on his Birthday? There are loads of toys and games for two year old boys to choose from. Some big brands offer great educational toys, so if you are trying to give a birthday gift for a boy pick one that will encourage their development. 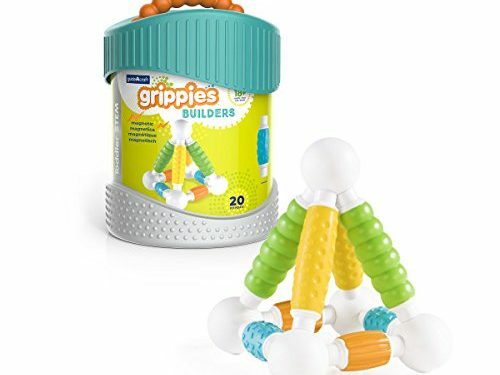 STEM toys are great for helping a toddlers development and if you are new to STEM they are worth checking out online here.